Heat recovery can reduce the energy burden of mechanical ventilation by 20%. If a building’s occupants do not feel healthy and happy then they cannot be productive, so getting the indoor air quality right is an important step to delivering a ‘good’ building. Perry Jackson of Mitsubishi Electric looks at how effective mechanical heat recovery ventilation can help both the wellbeing of occupants and overall building efficiency. Several factors affect how we react to the indoor environment — including access to daylight, lighting types, temperature and space. However, one element that has a major impact on our sense of wellbeing is ventilation. • low internal pollutant rates from materials such as carpets and other sources like photocopiers. Naturally found contaminants in buildings include compounds released from carpet glues, CO2 from occupants, odours and particulates from equipment such as photocopiers. Sick-building syndrome (SBS) is one possible result of poor health caused by buildings. Although not entirely due to ventilation (other causes include lighting and ambient noise), lack of fresh air is one of its major causes. Symptoms include skin irritation, headaches and lung irritation. Ventilation systems combat these problems by sending fresh air where it is required, minimising pollutants and optimising occupant health. Part F of the Building Regulations (2010) deals with ventilation in buildings. For non-domestic buildings the required ventilation rate is 10 l/s per person. Changes to the ventilation rate should accompany increased occupancy levels. BS EN 13779 – Ventilation for buildings suggests that for a high standard of indoor air quality, a ventilation rate of 15 l/s per person is more appropriate. Ventilation can also impact on temperature, with higher ventilation rates increasing IAQ but possibly causing draughts and discomfort for occupants. Designers need to be aware of this aspect of comfort when calculating ventilation rates. There are various ways of ventilating buildings. Natural ventilation may not be an option in highly polluted urban environments or in deep buildings with large floor sizes. For many situations, mechanical ventilation is therefore required and there are three main approaches. • Supply-only ventilation creates a positive pressure within a building, which in buildings with leaky fabrics means that air is less likely to infiltrate. • Extract-only systems remove air from a space mechanically, causing negative pressure thereby drawing fresh air into the building through passive openings. Moisture can be extracted from the incoming air to reduce moisture within the building by using dehumidifiers. • A balanced ventilation system supplies and extracts air simultaneously, combining the benefits of both systems. An air-handling unit (AHU) is a key part of a mechanical-ventilation system. The AHU uses internal coils with water, steam or refrigerant for heating, and chilled water or refrigerant for cooling. It connects to a ductwork ventilation system that distributes air through the building (often using fan coils to help adjust the temperature of supply air in larger applications) and returns it to the AHU. In traditional systems, hot water or steam (for heating) is provided by a central boiler; cold water for cooling is provided by a chiller. The latest AHU technology uses inverter-driven heat pumps for both heating and cooling, which is highly energy efficient. Many commercial buildings require mechanical ventilation and in such cases, heat recovery can help to save energy (by up to 20%) by reducing the heating and cooling requirements. Mechanical ventilation has the potential to be a high energy-using area of building service. However, with considered design, proper commissioning, good control and continuous maintenance, the operation of mechanical ventilation systems can be both effective and efficient. Consideration does need to be given to key equipment such as the AHU. Specific fan power (SFP) is an overall measure of the energy efficiency of a ventilation system. It measures the amount of energy required to move an amount of air through the system, taking into account pressure drop and fan power (Table 1). The performance of ventilation systems at different flow rates is covered in the Building Regulations, which state that ‘air-handling systems should be capable of achieving a specific fan power at 25% of design flow rate no greater than that achieved at 100% design flow rate’. Fans with variable-speed drives are recommended. Also, when considering the long-term energy efficiency of ventilation systems, designers need to be aware that ductwork has a significant impact on performance. If ductwork unnecessarily adds to the resistance that the fans in the AHU have to overcome, that will increase the specific fan power of the system. Well-constructed and installed ductwork is recommended, with a view to reducing leakage and air resistance. 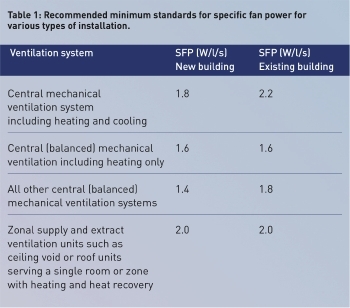 Building Regulations also include recommendations for types of control for use with ventilation systems. These include time controls, defrost controls and overheating controls (depending on the functionality of the system). Demand-controlled ventilation (using CO2 sensors) is considered highly effective at ensuring that ventilation is only delivered when it is required. Commissioning is an important step in ensuring that the system is set up from the start to operate effectively, and detailed guidance is given in CIBSE Code A3. This document takes a step-by-step approach to all aspects of the ventilation system from components of the AHU, through to ductwork, flow rates and electrics. With careful attention to selection, installation and operation, a mechanical ventilation system will give highly efficient and effective service for many years.